“I have too many earrings!” - said no woman ever! We just cannot get over them. We want so many options to choose from all the time. Thanks to our fashion icons who make us want to try new trends with their interesting ear pieces. 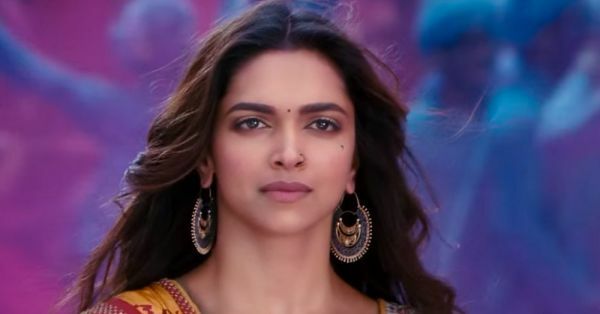 One such major one was Deepika’s chand baali earrings in Ram Leela. They surely were stunning, and got all of us inspired to try them. That trend wasn’t a fad, it stayed and that’s why we bring to you our latest favourite chand baalis! The numerous pearls gathered in a semi-circle surely make for one satisfactory pair of earrings. It’s got the extravagance, the fun quotient and the simplicity to be worn with most outfits! Price: Rs 507. Buy it here. 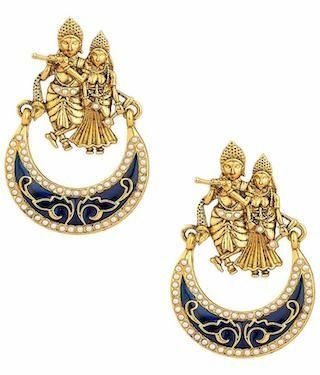 This beautiful pair of earrings with the most loved couple Radha and Krishna is for every girl who loves to wear something kitschy. The midnight blue coloured crescent with shiny details around, just add the right kind of illumination to the pair. Price: Rs 399. Buy it here. 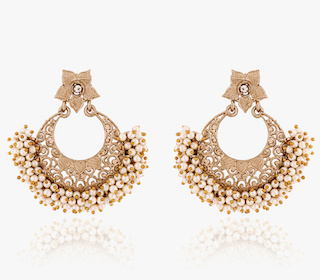 The kind of earrings that grace your ears need to look like a million bucks! This one is almost there, with all the gold plated coins neatly put together and the powerful flower just adding that pretty charm. Price: Rs 899. Buy it here. To add that spice to every dull outfit. To make black look bolder and white look more fierce, here is the red you need. 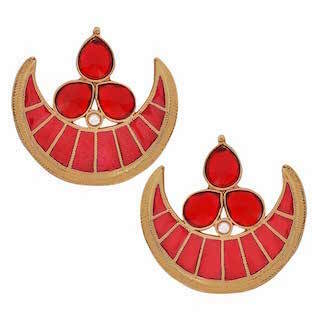 This neat pair of chand baalis has sharp curves to bring an edge to your style. Price: Rs 604. Buy it here. This chand baali with a twist is special. 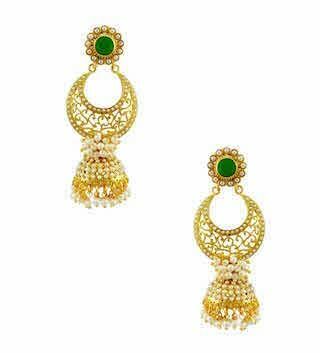 It has a pair of jhumkis fused into the chand which looks extraordinary! The green stone adds the richness, and that’s what makes it a total winner! Price: Rs 1,315. Buy it here. Some stars on your ears is never a bad idea. 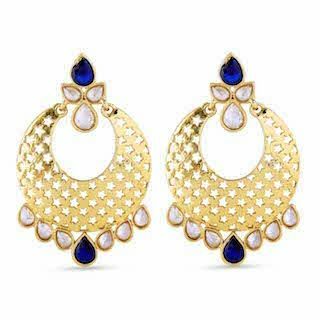 The blue and white stones around and a solid gold base with star cutouts make the perfect pair of earrings when you are wearing an ensemble in these hues. Price: Rs 760. Buy it here. 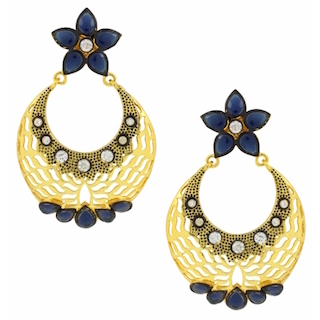 When you feel like experimenting, this pair of earrings makes the mark. 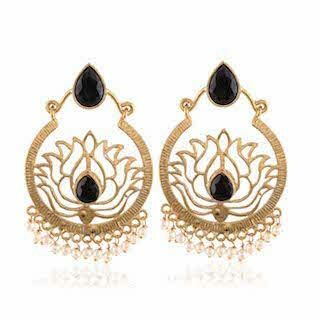 The lotus surrounded by the circular piece and black stones is definitely on our to buy list. It’s exquisite yet not OTT. Price: Rs 450. Buy it here. 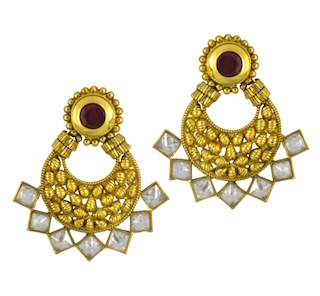 The most alluring part of these earrings are the square shaped elements attached to the delightfully intricate chand. It surely has geometry woven in a very strange yet artistic way! Price: Rs 799. Buy it here. 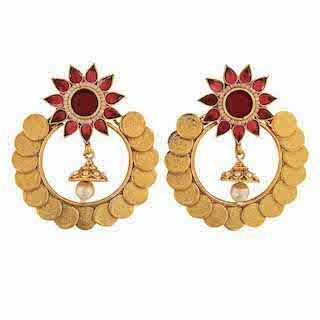 An all gold pair of earrings that works well with most Indian outfits. 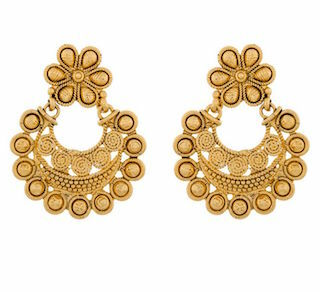 From a saree to an anarkali and even western silhouettes, try these blingy earrings for some magic! They surely look rich and elegant! Price: Rs 299. Buy it here. This remarkable pair is lovely for all the times you are looking to amp up your look. 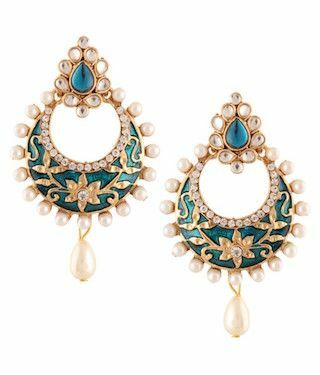 The pearls all around and the carefully crafted gold flowers and weaves lend a lot of charisma to this pair encrusted on a teal hue. Price: Rs 398. Buy it here. There is something about the way the thin metal lines merge into each other to look like one complex frame. It makes this pair enticing. The coloured stones add just that much more excitement to it! Price: Rs 630. Buy it here. A pair of earrings that do the talking? This is the statement piece you’re looking for. The yellow and blue are not just simply usual. There is something amazing about them. Price: Rs 984. Buy it here. 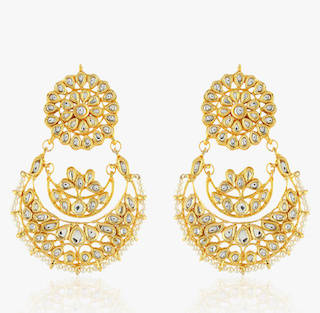 This pair of simple yet beauteous earrings has stolen our hearts. 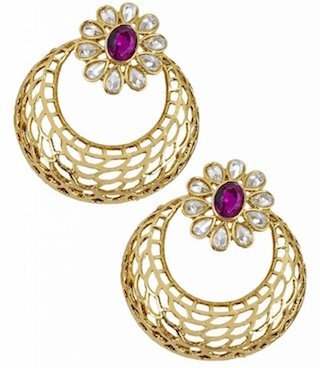 The magenta stone surrounded by petals and the grid-like gold structure at the bottom makes this pair one that’ll complement any and every Indian outfit. Price: Rs 702. Buy it here. 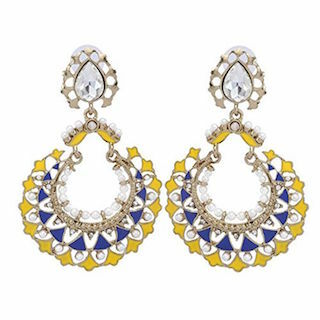 This pretty pair of earrings is the most dramatic because of the choice of colour. It’s neither black nor bright. It’s got the right combination of gold and midnight blue to make it worth investing in! Price: Rs 1,064. Buy it here. We all know that we need these ones. 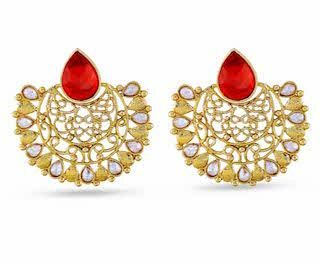 The simple kundan work in elaborate settings is for the woman who loves her conventional pieces with oodles of stylish glam. This one is a sure shot buy! Price: Rs 999. Buy it here. Pick your favourites and get shopping ladies!